After 10 months of doing no drilling on Mars, NASA cautiously did a test run with the Curiosity rover’s drill last week, using a new technique. NASA’s Curiosity rover has a drill that is essential for collecting samples from within Martian bedrock for chemical analysis. But it’s been broken since last December, throwing a wrench into plans to conduct a detailed examination of organic material on the Red Planet. After 10 months of doing no drilling on Mars, NASA cautiously did a test run with the Curiosity rover’s drill last week, using a new technique. There is hope that the function will be restored, though the space agency warned in a statement that the delay in drilling rocks will persist for at least a few more months as the technique is refined. The drill had ceased functioning properly just as the Curiosity team was preparing to examine organics on Mars. Organic molecules, in some cases, are indications of life. Curiosity is designed to look for habitable environments, while the successor rover Mars 2020, which is set to launch in three years, will cache samples with evidence of past life. Learning more about Martian organics will give scientists a better indication of how habitable the planet was in the ancient past, particularly when water flowed on the Martian surface. The rover’s arm used stabilizers (two contact posts) that were placed on the target rock before the drill bit was extended to make contact with the rock. But a mechanical problem deep in the drill prevented the stabilizers form being reliably deployed late last year. Curiosity has continued observations with other instruments in the meantime, as managers worked on fixing the drill. With the drill on Mars disabled, NASA engineers on Earth have spent several months testing new ways to make the instrument work again on Mars. NASA’s Jet Propulsion Laboratory has a “Mars yard” where rovers are regularly tested for work on the Red Planet; it’s also used for troubleshooting issues when they arise on Mars. A near-twin of Curiosity underwent testing there to come up with a new way to get the work done. NASA is testing a new technique called “feed-extended drilling,” in which the motion of the drill’s arm moves the bit directly into the rock. 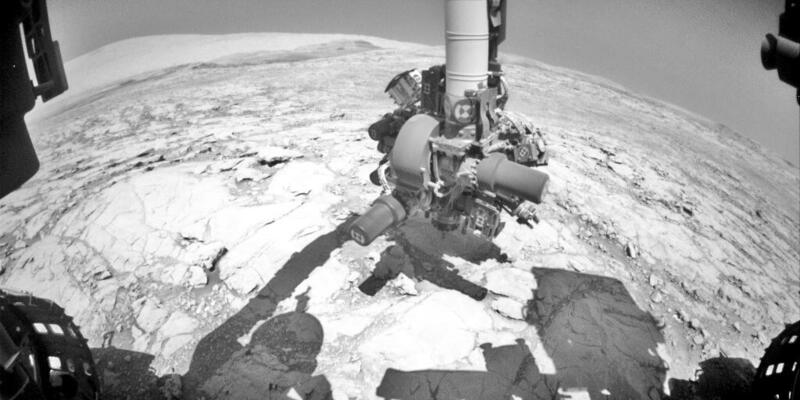 During the test, which was conducted on Oct. 17, Curiosity cautiously moved its drill to the ground, pressing the arm down and also moving sideways slightly. It took measurements with a force sensor, in order to make sure that the drill didn’t get stuck in the rock. Besides changing the drilling procedure, Curiosity’s managers are also looking at ways to deliver samples to the rover’s deck without using the drill feed mechanism. (The previous process required that the drill be withdrawn, and not fully extended.) Curiosity has acquired sample material using the drill just 15 times between 2013 and 2016. The rover landed in Gale Crater in August 2012 and quickly found evidence of environments altered by water. It arrived at its ultimate destination, Aeolis Mons (which NASA nicknames Mount Sharp) in September 2014. The rover has steadily been progressing upwards on the mountain, looking at layers to learn more about how the mountain was formed – and how much water was available. Curiosity is currently on “Vera Rubin Ridge” on the lower part of Mount Sharp, looking at an iron-oxide mineral called hematite, a mineral that tends to be deposited in water-rich environments.